Delhi's All India Institute of Medical Sciences has become the country's first hospital to launch a new technique to detect artherosclerosis -- a disease of the blood vessels caused by cholesterol deposition within the arteries. Called the Intra Vascular Ultra Sound (IVUS), the new technique is currently being demonstrated by K Sudhir, associate director of vascular medicine at the Alfred Hospital in Melbourne, Australia. He is assisting Upendra Kaul, professor of cardiology at AIIMS, who is instrumental in launching the IVUS in India. This technique is extensively used in Europe and USA. 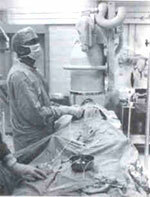 The technique involves inching a long, thin, flexible, plastic tube called a catheter fitted with a probe into an artery. The probe sends out high frequency sound waves that penetrate the walls of the blood vessel, and are then reflected forming an image of the artery, which can be visualised using sophisticated electronic equipment. The probe is 1 to 2 mm in diameter and is rotated at 1,500 revolutions per minute to yield a circular image of the blood vessel.